This spotlight is on our new Director of Sponsorship, Russell McMahon..Russ is an associate professor and the assistant director of the undergraduate BSIT program at UC. He feels volunteering is a great way to give back to the community while also working with great people. I am married and have three grown children and two grandchildren. 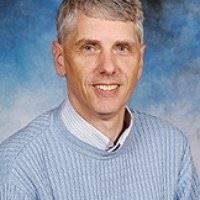 I have been teaching IT-related subject matter since 1980 and has been a faculty member in the School of Information Technology at the University of Cincinnati since 1999. I am very active in the IT user group community having served on the boards of multiple groups over the years and most recently the Cincinnati chapter of Infragard which is the FBI-private business collaborative centered around all areas of security including cybersecurity. I am also a member of the Cincinnati Chapter of the Professional Association of SQL Server (PASS) planning committee for their annual conference. I am also a program evaluator for ABET which is the accrediting organization for engineering and computing programs. In 2014, I spent six months working at three universities in three different countries (Rwanda, Kenya, and South Africa) in Africa doing IT curriculum development and giving talks on creative problem solving. In the past year, I gave workshops on improvisation and creative problem solving including the 2018 eLearning Africa conference held in Kigali. I am a Fulbright Specialist and worked at Miras University in Shymkent, Kazakhstan this past February-March 2019. I helped their faculty with their English as well as giving workshops on improvisation to students and teachers. Q: Share details about your role with the University of Cincinnati. I am an associate professor and the assistant director of the undergraduate BSIT program. I teach programming, database management, and cybersecurity courses. I enjoy seeing my students grow and following their careers. Yellowstone National Park is my favorite place in the US to visit. Outside of the US, I would say traveling the Garden Route in South Africa between Port Elizabeth and Cape Town (from the Indian Ocean to the Atlantic Ocean) is one of the prettiest drives anyone could take with plenty of interesting stops in-between. Back in the late 1980s – early 1990s, I was a member of the predecessor to ATD which was ASTD. Meetings were held at Cincinnati State. The past two years I joined again and got involved with the planning of the 2018 conference and again this year. I have served on multiple boards of different IT-related groups for the past 20 years and feel it is a great way to give back to the community. Plus, you get to work with some really great people. I enjoy reading about the history of science and technology and researched the history of computing at the University of Cincinnati and the Cincinnati region which is documented in a blog that I continue to maintain. In 2017, I started taking classes on improvisation which has led to my conducting workshops at academic conferences both nationally and internationally.